The Blue Book of Guitars, aka the guitar blue book, is an indispensable guide to the second hand value of whole range of guitars. The Blue Book of Guitars to give it its proper name, has become the go to place for anyone buying or selling a second hand guitar in order to figure out what said guitar is worth. It’s been so successful that it’s spawned a whole series of more specialist books, such as the Paul Reed Smith Pocket Guide, and a special edition book on Marshall’s legendary Bluesbreaker amp. The guitar blue book is popular for its easy to understand layout as well as its accurate values. It works by splitting used guitars into various categories, depending on their condition, and then providing a value for each. So, if you had, say, a mid-1990’s Korean-made Epiphone Les Paul with a couple of nicks in the paint work, that would be in the ‘excellent plus’ category. So you’d look up the guitar and match its condition with the category to find how much its worth. The four main books, covering electric guitars, acoustic guitars, amplifiers, and mandolins, are available in book form or as an online subscription. The online option makes it easy to access the database of values on the web, and you can subscribe to all four books together for up to a year at a time. 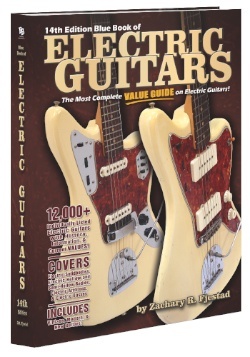 Both guitar books are also available on DVD, while the amplifiers book is on CD.